Partners in Island Education now oversees four scholarships as part of its mission to enhance educational opportunities for the students of Vinalhaven. Two of these are for travel and education. Thanks to the generosity of an anonymous summer family, PIE is able to offer a new scholarship to help students pay for educational programs and travel opportunities. The one time gifts range in amounts of up to $2500. Scholarship application deadlines are January 15th and May 15th of each year. Tim and his Nepal travel group. “On the afternoon of July 13th, I met my Putney Student Travel group in New York City. The next morning at 4 a.m. we were to begin our trip to Nepal, where we would participate in community service activities. After two flights and over thirty hours of travel, via Hong Kong, we arrived in Kathmandu, Nepal. By this point, thanks to the travel, our entire group had already bonded. 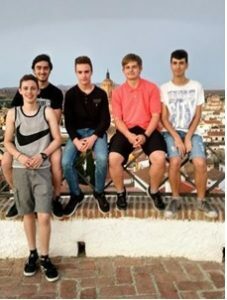 We were all from different areas of the United States, but the fact that we chose a lesser-developed country to travel to, over, for example, Europe, said a lot about our personalities, and that brought us closer together. 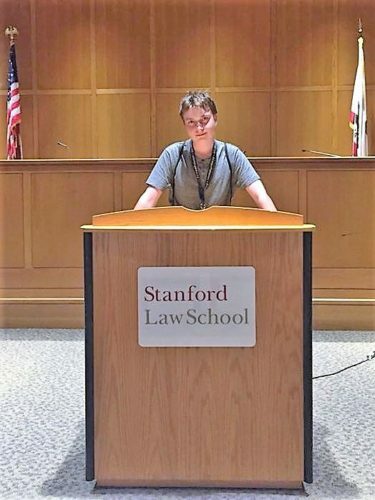 “From July 2 to July 12, I was attending Stanford University in sunny Palo Alto, California for a 10-day program on Intensive Law and Trial. Upon getting to the campus, the hardest thing for me to get used to would be being around that many new people at a time. Once everyone was settled in, we went to the first of many lectures that we went through in the 10 days we were there. These lectures would teach us the structure and basic procedure during a trial as well as teach us different loopholes to get us out of certain situations. Then on the last day, we had a mock trial to get real experience of how it all comes together in the real world. “Thank you for investing in my future by granting me the generous P.I.E. Scholarship. Without it, I would not have been able to attend the Pre-College Program at the Maine College of Art. I had an amazing experience at MECA. While I was there, I took three main classes. These classes were Ceramics, Woodworking and Furniture Design, and Life Drawing. In ceramics, I learned how to wedge clay, use underglaze, and I used the pottery wheel. In Woodworking and Furniture Design, I learned how to manage my time wisely to finish all of my projects, how to sculpt wood, and I also got to see how different this class was compared to my father’s shop class. In Life Drawing, I got to use charcoal, charcoal dust, and graphite to draw my projects. I had never been in a Live Drawing class before – when I went to MECA, it was a whole new experience for me but I easily liked the class. I also did a lot of activities within the city of Portland. I went to a gelato shop, a small store on the side of the road that sold gelato. I also went to the movie theater where I saw Ant man and the Wasp. We enjoyed a morning at Portland Headlight exploring the fort ruins. I attended a Sea Dogs baseball game followed by fireworks. 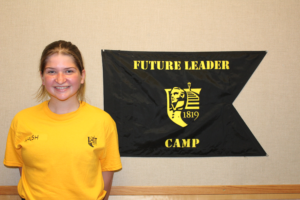 “Future Leader Camp (FLC) was a window that allowed me to view into my upcoming freshman year at Norwich University (NU). Knowing the standards that NU sets for students in the Corps of Cadets (CC), I understood that I had signed up for intense training in FLC. By motivating myself to step out of my comfort zone I would become ready to take on the real world. 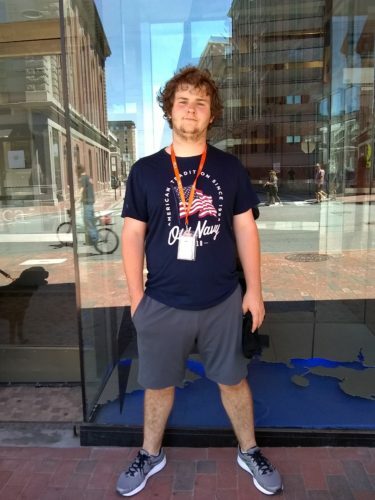 “From June 29th to July 1st I attended the Congress of Future Science and Technology Leaders in Lowell, Massachusetts. 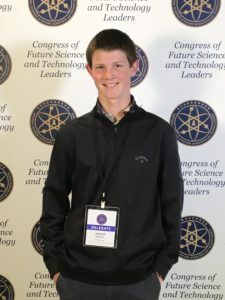 Thousands of student delegates from across the country congregated at the Tsongas Center in downtown Lowell to discover secrets of success from some of the most influential people in the fields of science and technology. Among the dozens of speakers were MIT graduates and Nobel Prize winners. My favorite speaker was Dr. Robert Metcalfe, inventor of the ethernet, founder of 3com, and a recipient of the National Medal of Technology and Innovation. I was lucky enough to meet Dr. Metcalfe (who has ties to Vinalhaven) before his presentation and talk to him about the Congress and the importance of making lasting connections. Ironically, this summer, I ran into him at Greets Eats and he invited me to have lunch with him and his friends, who each gave me tips on decisions regarding my future education. 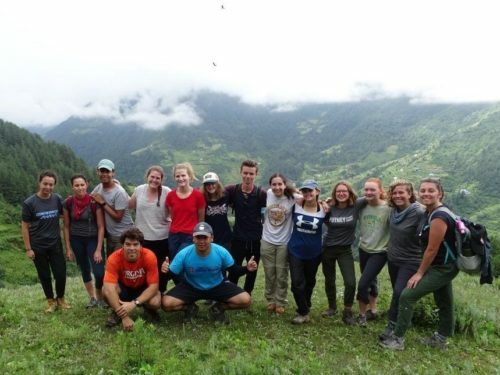 “My trip to Costa Rica with others from across the US, gave me a chance to participate in new activities, meet new people, try to speak a new language, eat new foods, and really immerse myself in the Costa Rican culture. We went tubing down rivers, zip lining through the jungle, and white water rafting. I stayed with a Spanish speaking family, saw landmarks such volcanos and hot springs, and went on night hikes to learn about animals in the forest. We built a wall for a local home, and played with kids at a local school. During our free time, our group shared lots of fun and laughter. 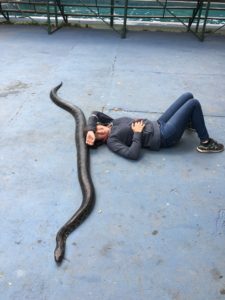 My namesake, André, was the biggest and one of the nicest snakes we had at the exotic animal rescue. 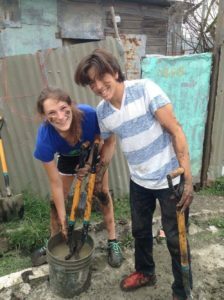 “I decided my Junior year that I was going to take a gap year and come to Guatemala. I’m so glad that I stuck with my decision because it has been life changing. I have volunteered with both children and animals, most of my time with exotic animals. We rescued animals people brought to us or animals being smuggled across the border. We treated and released them back into the wild if they were able, but if not they lived with us permanently. It is such a unique experience I would have never had if I did not come to Guatemala. Not only did I get to volunteer and help people and animals, but I experienced a whole different life I never really knew existed. I have a better understanding of the world and what’s outside of my tiny little island that I grew up on. Living in a third world country also made me appreciate the life I have back home. I am so fortunate to have everything I do and that I was able to come on this trip and realize this. Another exciting new scholarship opportunity! In partnership with The Experiment, PIE is offering a scholarship to ONE high school student per year who applies and is accepted into The Experiment summer program. PIE will contribute $2500 and The Experiment will contribute $2500 to this scholarship, making a total of $5000.